Only the evening before, a friend had warned me about the shifting sands of the estuary should I try to get close to the stone, confessing her own driven desire to seek out the totems and talismans of the landscape as we spoke. 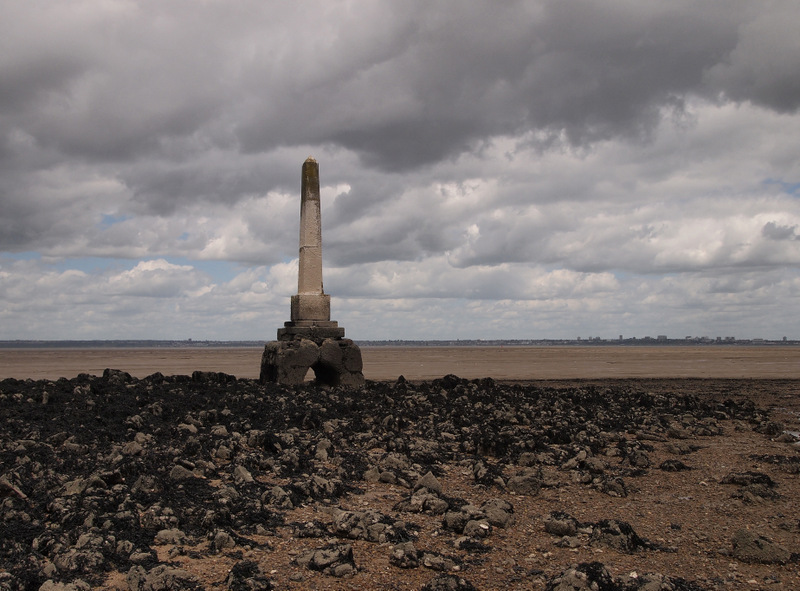 Off the coast of the Isle of Grain, the London Stone at Yantlet Creek had intrigued me from the moment I first read of it. It was one of the evocative boundary markers on the Thames that had delineated the jurisdiction of the City of London in former times. 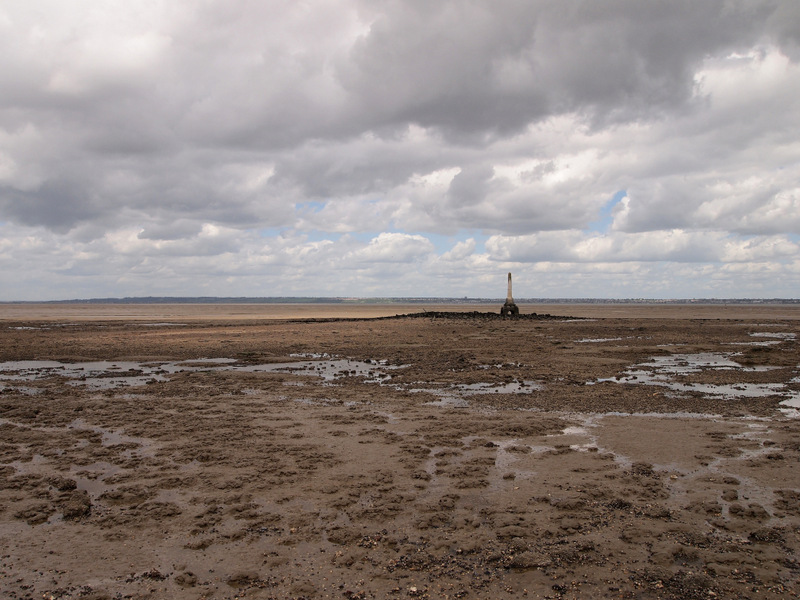 The stone stands where the river meets the sea, and is exposed on the shining mud flats when the Thames retreats. 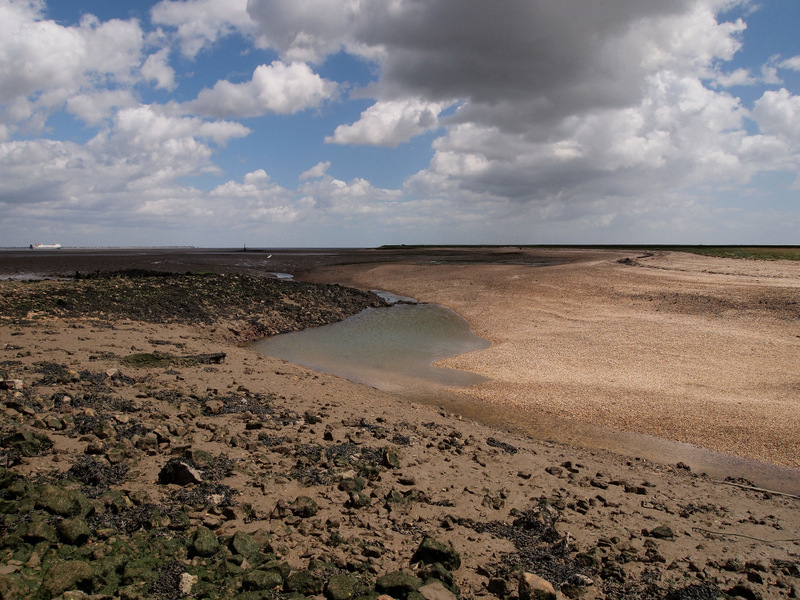 But being far from a specialist when it comes to the tides that envelop the estuary, and even less of one with regard to the strange alchemy of silt stirred with water, I had no plan to cross the river bed to reach it. 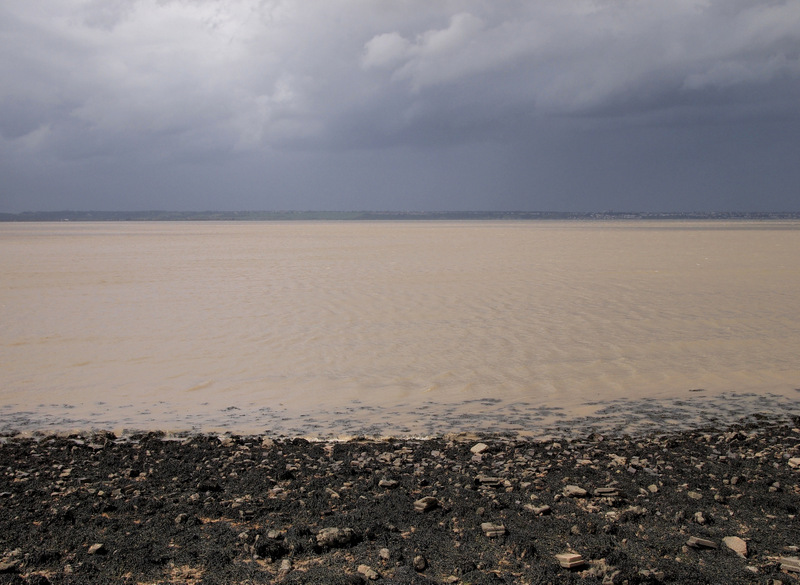 The tide was out as I curved along the seawall of the Hoo Peninsula, revealing a palette of worn browns and rinsed blues where the river had run. In places mud was ridged into the shape of the vanished waves. Seaweed slicked the shore, dark and glistening. The clouds in the wide estuary skies were in spate, streaming out to sea with a violent westerly. Rain slanted like a storm of arrows, cold and stinging as it fell. The stone obelisk rose into view as I walked, far out and solitary on a midden of crusted rocks. I knew then, seeing it isolated by tides and exposed to the winds and rain that stampede across the estuary, that all my earlier intentions had been suspended. I suddenly wanted to be in its presence; near the barnacled base that has held it steady through nearly two centuries of swirling currents. I wanted to stand in the sway of the empty river. What is it that forges these connections and correspondences, these strange allegiances that emerge between people and place? I have long been drawn to stones, like moths to flame; they speak to me in the same way as stories. Like the paths that have radiated and been remade across the land for millennia, they express meaning that is native to the places they are found in. Some of the commonest stones have been guides to a territory, set as signs to preserve a sequence of steps across moorland or marsh, marking a way for the traveller or tributaries of trade. Unlike the formal monoliths raised to commemorate empire and victory, the stones discovered along the edges of rivers and fields speak a vernacular tongue. They are ancestral and confiding, bequeathing to us a pattern of past use. The water in Yantlet Creek was trickling out to sea when I reached it, like sand in an hourglass. I made up my mind when I saw the tide was still running out, but knew it was best to be quick, unsure how swiftly it might race back when it turned. The slick sides of the hollow creek were shiny with mud and my first step nearly sent me spilling down the slope. Finally I found a litter of crushed bricks that led to a narrow waist of water. A few rocks had been tipped into the stream as a makeshift bridge. When I hit the beach on the far side, the clouds were suddenly pulled like a curtain from the sun. In the hot white light, those lone and level sands stretched away, a mire of tidal flats that touched the distant, silver sea. The sun-fired shore curved away in the shape of a swift’s wings. I crunched over a reef of countless sea creatures, their shells as bright as cleaned bone. Large ships slid into the distance, surrounded by a shimmering haze that made them appear to float through the air. I walked fast along the beach and finally out onto the river bed, stepping slowly across a watery glaze that was pitted with black rocks. A skirling wind spun shadows ahead of me. Nearly at the stone, the sands started to give way, parting with each step so that my boots sank into the sudden, deepening folds. I turned back to shore, eyeing the elusive stone column that stood sentinel off the coast. Working my way around the headland I eventually found a path, a causeway of small rocks and clinker laid down over the years that lead me across the sinking sands. The London Stone marks a place first measured out by the charter of King Edward I in 1285. 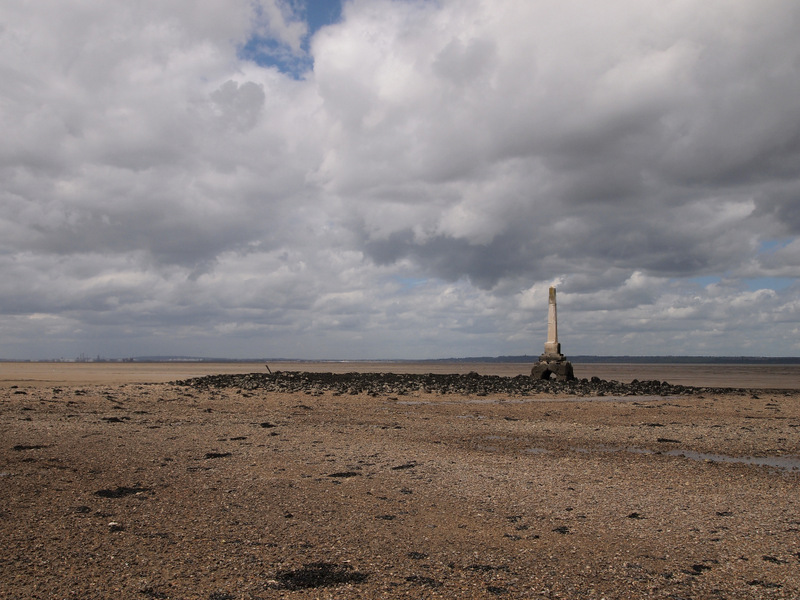 Standing 54 kilometres from London Bridge, the stone – linked by an invisible line to the Crowstone at Chalkwell on the north side of the river – once marked the extent of fishing rights on the lower Thames. Although the obelisk itself is Victorian in origin, it’s probable that a marker of some kind has existed at this site for the past seven centuries. To stand beside it opened the old river to view. The stone markers of a landscape work like memories, reminders of their makers, of the ways of life that governed the age, from the histories of dockers and lightermen criss-crossing the teeming Thames to the bootleggers and fugitives that hid in the marshes alongside it. This lonesome curve of coast has steered generations of men and women out to sea or returned them at journey’s end and this column, caught in the tangle of salt water and fresh, seemed to speak for them all. I reached up and pressed my palms against the weathered stone, where other hands had held it to shape and raise it tall, before I turned and headed for shore. I followed the watery path that my feet had dimpled across the sands, and safely re-crossed the creek. And as the sun paled into grey light I could hear the song of the far river, rising with the tide. Julian, I began to worry when you indicated you didn`t know the timing of the tides. Here on the Bay of Fundy where the water can rise 45 ft in 6 hours, one must understand where they are in the tide cycle before setting off on a quest like yours. Nevertheless I understand your compulsion to touch that ancient marker. I would have been there trotting beside you had the opportunity arose and thousands of miles not separated us. Thanks for the good words, Sybil. 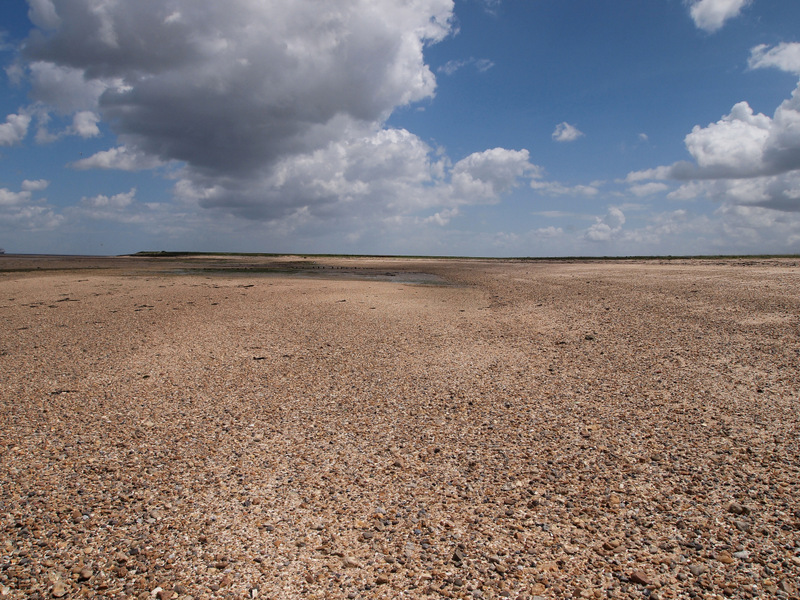 I knew the tide was still going out by the direction of the water in the creek and the stone isn’t so far from the coast of the Isle of Grain that you couldn’t go back that way. It was the shifting sands that I was most unsure of. The Thames is a poor relative compared to the Bay of Fundy when it comes to the speed and height of the tide! And yes, the stone is still visible at high tide; the last photo is just of the lovely estuary light on the Thames later that day, a light that I’ve come to adore. And thanks for your interest in trotting along side – I always appreciate company on these journeys! Evocative sense of place as always Julian and I can see how you could not resist the siren call of the stone. The photographs give a wonderful sense of the journey and the shifting landscape in which the stone has stood for all of these years. Best wishes. Many thanks, fifepsy. Your own wanders have come to mind from time to time while out in the estuary – the richness of many things that comprise the landscape. Hope all is well and best wishes from here! Thanks, Verena; delighted you enjoyed it! Julian this is amazing. Thanks once again for the journey! I am actually finally on a journey of my own visiting Newfoundland and all its wonderful history! Wish you were here! Thanks ever so much! And I even more pleased to hear that you’re visiting Newfoundland – a place I’ve long wanted to see and explore. Bet you’re having a marvellous time. So pleased you liked the post, and enjoy your own island wanderings!! We had the great pleasure of meeting Julian when he visited the Thames Estuary recently. Where the river meets the sea is precisely where Lord Foster wants to build the worlds largest hub airport. This would mean the destruction of habitats of local, national and international importance that are protected by LAW. 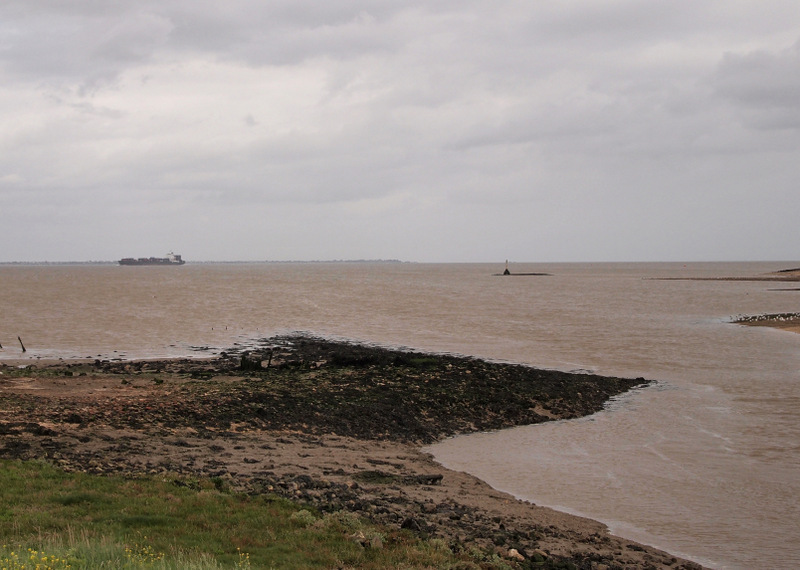 Help us to protect our natural and cultural heritage here in the Thames estuary – say NO estuary airport ever! 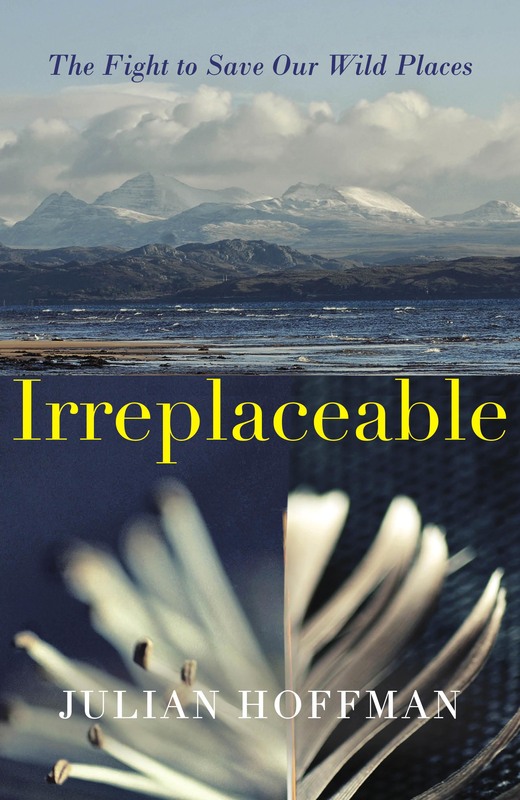 Thanks, Julian, for a particularly fine post, full of eerie resonances and an almost Iain Sinclair-like attentiveness to the strangeness of place. 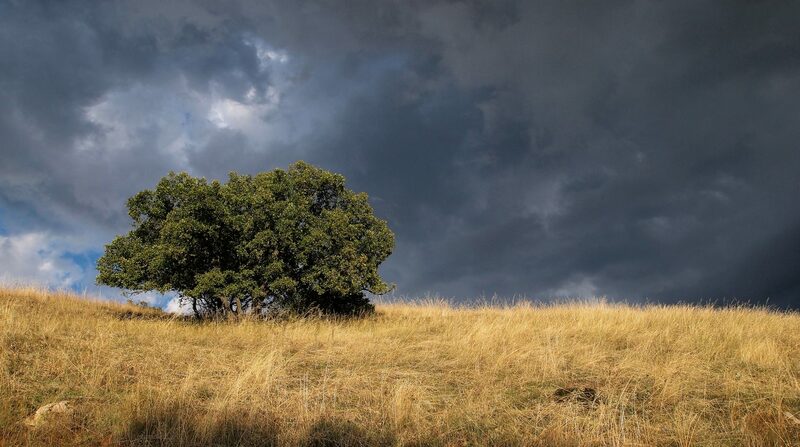 There’s something particularly attractive about flat landscapes, and your photos have captured well that vastness of sky and sense of deep perspective. Good to see you writing again! Thanks ever so much, Ian. I have to say, it feels good to get back to some writing! Between preparing for the book and actual paid work, time for writing has dwindled. But it’s been a joy exploring new areas in the last few months, particularly the Thames estuary, and to put words to paper again, so I’m delighted that this post resonated with you in such a way. The strangeness of place, so true; it’s one of the things that compel me most while out beneath those vast skies, as it does you I think. 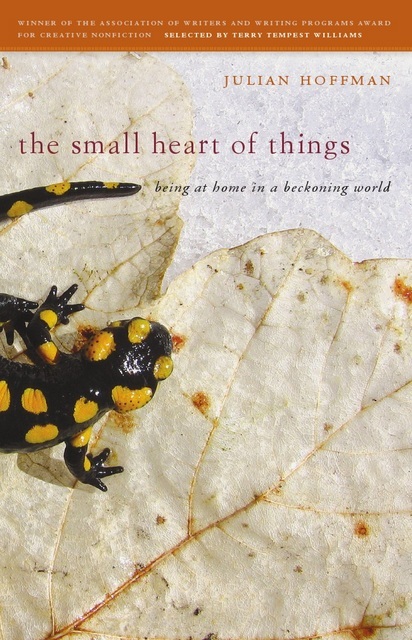 Wonderful to read these evocative descriptions that these over-looked places deserve. The quality of light that can only exist in these places is reflected in the poetry of your writing- luminous comes to mind. Once again the photagraphs are more than mere illustrations. Thanks for the good words, Sid. You would have enjoyed the journey, that’s for sure. All that light piling up in the skies and swift shifts of colour across the flats. Beautiful, mesmeric place. Looking forward to when we can next walk together, my friend. I feel that I took each step of this journey with you, with rising anxiety about mud sucking and holding feet fast when time turns the tide. But all worthwhile for the sense of the landscape, and the history of this stone. Thank you for another wondrous story. You didn’t have a chance. With sea and stone and history reaching out, you were lost in a grip that was full of dark, ancient beauty. When I walked among the castles of Wales and Western England, I marveled at the steps made round and smooth by…whom? It was delicious food for thought as I climbed higher and higher. So true, Aubrey. And all that stone you saw in your travels, made smooth by centuries of footsteps. There is the real history of the land, in the unsung men and women who travelled those paths before you. and a mention of the elusive word “halocline” that misty bend of salt and freshwater. Thank you for sharing your journey to the halocline. Thanks for sharing these stunning images, Claire. Such light and grace. i can only imagine the clear descent. And I have to confess that ‘halocline’ is new to me as well. That “misty blend” reminds me of borders, where a place is neither one thing nor another, but a fusion of varying elements, so rich in possibilities. I know that feeling of weighing the risks and benefits of a change of mind – the response to an urge to be nearer something that the original plan could grant only a glimpse in the distance. I can relate to the determination that sets in when obstacles need to be skirted, the eye always on the goal. I also feel drawn to stone – those here that have tumbled with glaciers, their edges all smoothed by the power of friction and water and time, and those pushed up from the earth by contractions of frost and thaw, as if new born. I can only imagine however, the feeling of being in the presence of something with such historically human significance – from the grand politics of seven centuries to visceral images of the labourers who laid the ’causeway of small rocks and clinker’ and erected the succession of markers. Your evocative description, redolent with physical sensations helps me with that imagining. It brings me closer to an experience that, though only vicarious, enriches me. Thank you, Julian.